A lifelong Vancouver resident is now a homeowner after a very lucky day at the fair. This year's PNE prize home winner was Keith Edwards, a library staffer from East Van who said he was still in disbelief the next day. "It’s amazing to be a homeowner now," he said as he toured his new home. "I never thought I'd be able to win a home. I've never won more than $100. A $50 investment paid off big time." It's an investment Edwards has been making for years. He's been going to the PNE and buying tickets for the draw, but never thought he'd win. "When he got the call, it was overwhelming. It's still sinking in," his partner, Wendy Pierce, said Tuesday. She and Edwards walked through the $1.8 million, 3,025-square-foot home, which includes an elevator, among other features. "I'm feeling very blessed right now… It's a dream come true," said Edwards, who had just applied for co-op housing. "When he tells the story of growing up in East Van and having his mom on welfare and wishing for something like this in his future… To hand him a key to this house and make that happen for the next chapter of his life is absolutely amazing," PNE CEO Shelley Frost said. As he prepares for retirement, Edwards said he feels like he's entering a new phase in his life. "I need to make sure it counts at this twilight of my life. Chances like this don't come often," he said. The modular home will be moved to Naramata this spring. Edwards is now deciding if he'll move in, or sell it and stay in Vancouver. "Now I have possibilities I didn't think I'd have," he said. 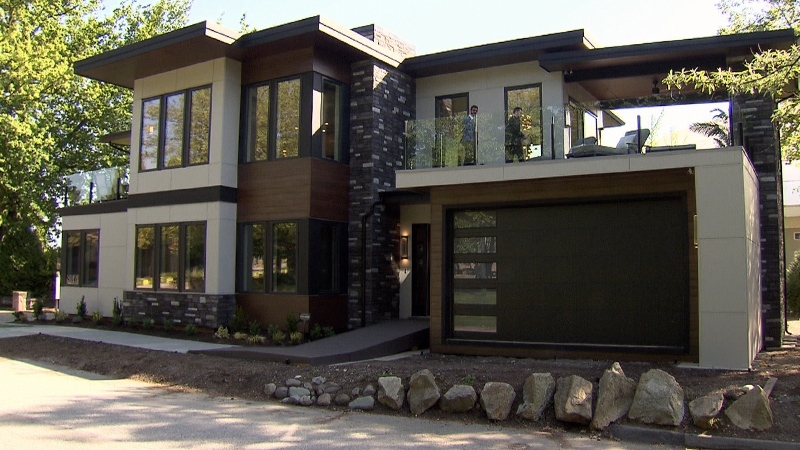 The 2018 PNE prize home is shown.